Coca-Cola is the world’s richest beverage company. The multinational corporation’s richness rests on the power of monopoly capitalists to rule financial capital, grab resources, control markets, and extract superprofits by exploiting the workers of different countries. Coca-Cola directly accounts for around 100,000 workers, but hundreds of thousands more are working in its supply chain. 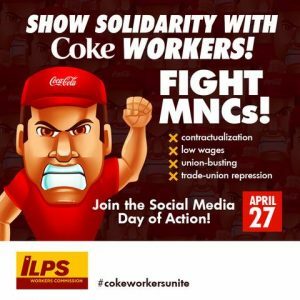 Workers face exploitation across the Coca-Cola supply chain – suppliers, product distribution, retailers, agriculture. Factory workers experience contractualization, unpaid overtime, union-busting, occupation health and safety and other labor rights violations. Coca-Cola’s agricultural supply chain in many countries is marked with poverty wages and repression. In many countries where it operates, it is involved in the plunder of resources especially water, the main ingredient of all its products. The company takes away water from poor urban and rural communities. Coca-Cola, one of the richest multinational corporations, is controlled by the some of greediest financial capitalists in the world. Coca-Cola is a US-based company which owns 500 brands including Coke, Sprite, and Powerade. It also owns local brands in different countries. Its system of company-owned and independent bottling and distribution operations are in 200 countries in Africa, Asia Pacific, Middle East, Africa, Europe, Latin America and North America. Its headquarter is in Atlanta, USA. Its declared revenue for 2017 is $35.4 billion. Coca Cola is a major sponsor of the biggest media networks – TV, print, radio, social media and major sports and entertainment events all over the world. Coca-Cola is highly influential in US government and in many governments around the world. It is also influential in trade associations, business councils, NGOs, universities, and research foundations. It has been reported as one of the biggest companies in US and around the world that evades tax by keeping its cash offshore or outside the country where its top officials are headquartered. 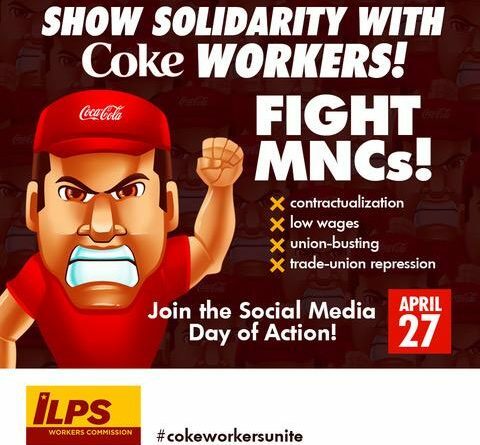 Post message of solidarity or share the e-poster below using #CokeWorkersUnite. The campaign is part of the Fight MNCs campaign of ILPS Workers Commission or Commission 5. We urge all trade unions, workers’ groups, agricultural workers and farmers’ groups, affected communities, and human rights, environmental and health advocates to join in the campaign. Link-up with us for the Fight Coca-Cola campaign. Share your updates about Coca-Cola workers in factories and the supply chain, and affected communities or sectors. Send the updates in ILPS email: ilps.commission5@gmail.com or ILPS Workers Facebook page. 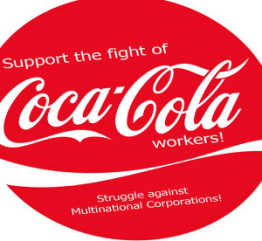 Support the education drive for Coca-Cola workers. These are workers who are facing struggle against short-term contractualization and other labor disputes, or workers who want to form a union.